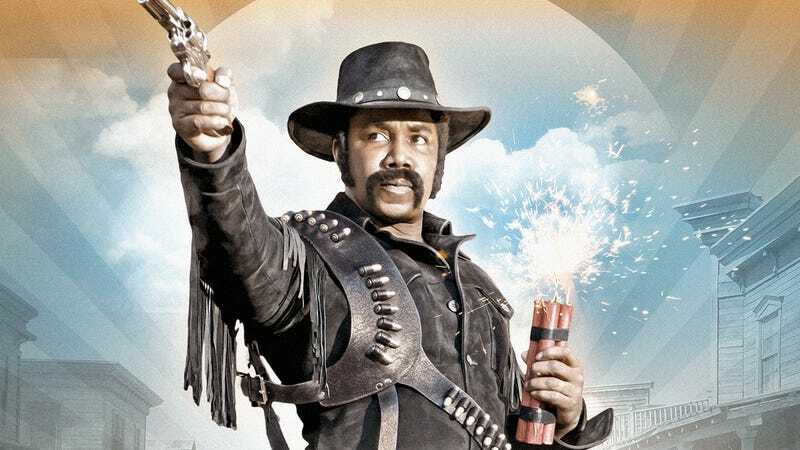 Michael Jai White’s 2009 cult-classic blaxploitation parody Black Dynamite is one of our most quoted films here at The A.V. Club, and so we were thrilled when he started teasing a new parody film on Twitter at the end of January. That film has since revealed itself to be The Outlaw Johnny Black, a Western parody starring and written by White in his sublimely goofy, joke-a-minute comedy style. Kym Whitley (The Boondocks), Tommy Davidson (In Living Color), and Byron Minns (Adult Swim’s animated Black Dynamite series)—all of whom also appeared in the original Black Dynamite—co-star. We spoke with White about the project the day before it launched a crowdfunding campaign on Indiegogo and on White’s own Jaigantic Studios site; as he told us in our interview, going the crowdfunding route was a very deliberate choice, part of his vision to bring greater inclusivity and a sense of community to the making of his films. The A.V. Club: When you first started teasing this project on Twitter, a lot of people, myself included, thought it would be a sequel to Black Dynamite. But that’s not the case. Michael Jai White: Basically, I think of it as being like Monty Python. It’s the same team doing another parody movie. AVC: And it’s a parody of spaghetti Westerns? MJW: I want it to be like the movies I grew up with that had that same ethos of the Western in the ’70s. Movies like Buck And The Preacher. They were family-friendly, and they were a really fun type of film. So it’s a return to that era. AVC: Did I hear you say it’s going to be family-friendly? MJW: Yeah, this one’s going to be a lot more family-friendly than its predecessor. [Laughs.] Plus, when you do a Western, it’s about paying loving homage to it. There are moralities and a code in the best Westerns that I think you’re going to have to adhere to if you’re going to step into that genre. AVC: Do you have the script already written? MJW: Oh yeah, the script’s been ready for quite some time. People have been very excited about the script; I had several offers to fully finance the movie, but I’ve chosen to do it in a very independent way. AVC: And you wrote it, then? AVC: Every time we write about Black Dynamite on our site, the comments are full of people quoting lines from the film. Did you take the same joke-a-minute approach with this script? MJW: It’s very similar. It’s got that same mindset, as if the creators of that film [Initial trailers for Black Dynamite “credited” the film to a fictional cast, with “all-star running back Ferrante Jones” standing in for White —Ed.] went and did a Western. It’s going to have the same sensibilities and layered humor, where you have the ridiculous and the deep and the outlandish all at the same time, along with the physical humor. I just believe that great humor should be layered, you know? Like a cartoon that appeals to adults and children alike, and everybody takes their own message [from it]. And with Black Dynamite, I did the humor in such a way where there’d be jokes that went over peoples’ heads until the second time they saw it. And it’ll be the same way with Outlaw Johnny Black. AVC: Can you tell me about the casting that you’ve done already, as much as you can? MJW: There are some major A-list actors who I want to keep kind of quiet until a specific time. And there are some big names that we’ve agreed not to reveal until the movie comes out, and that’s the way they want it as well. MJW: Yeah! It’ll be a surprise, you know? We’ll have cameos where people have no idea they’re popping up. AVC: You mentioned earlier you had offers to fully fund the film. Why did you decide to go the crowdfunding route? MJW: Beyond the Indiegogo, we’ve started a platform called Jaigantic Studios. It’s a site where we can be continually connected with our audience. We’re going to build that [platform] on set all the way until the screenings and have all kinds of fun giveaways and opportunities for people to get involved, people who have never in their lifetime been connected to the production of a film (like that). Movies outlive you. After you’re long gone, people will still be able to see what you’ve done. For a lot of people, that’s a bucket list item, and I want to give them the opportunity to be involved. AVC: Looking over the Indiegogo rewards, you can be very involved in the film. You can be in a bar fight! MJW: Yup, exactly, You can be shot in the back by Johnny Black. Really, when it comes down to it, I want to give everybody an experience that’s going to last them a lifetime. To thank those people who supported Black Dynamite and my movies in the past. I wanted to be able to thank them directly. See, if I went with a studio, they don’t really care so much. I like to be in people’s faces. I want to make this a community event. I want to return to theaters and have people laugh and really enjoy themselves. It’s something that people are a little more awakened to recently, with Black Panther. There’s a community there—not just the black community, but a movie-going community that came together to have fun and appreciate and experience something together. That’s what I want the Jaigantic brand to be. AVC: Can you tell me anything about what the movie’s about? MJW: Well, like at least 80 percent of Westerns [Laughs. ], there’s a good guy and a bad guy. There’s a revenge story. There’s a guy named Johnny Black who’s trying to elude the law and a posse, and he might have to hide out as the neighborhood preacher to get away from them. It’s the story of a guy who very early on had reasons to turn his back on religion, and the irony is that he has to hide out as a preacher. AVC: I’m picturing a Django-type character. MJW: Not necessarily Django. Just think of any Western character, black or white, who’s lost his way and he’s finding his true nature, and that some things are bigger than he is, and sometimes helping out the little man is what you’re called to do. In truly heroic fashion. AVC: So are you going to use karate in the Old West? MJW: Oh yeah, there’s going to be martial arts in this film! You better believe that. The Indiegogo campaign for Outlaw Johnny Black is live now, with donor levels ranging from $10 to be part of the behind-the-scenes updates White teased in our interview to $100,000 to be an executive producer on the film. (Getting shot in the back or punched in the jaw by Outlaw Johnny Black will cost you somewhere in the low five figures.) The campaign has an ambitious goal of $1 million to fan-fund the film (Jaigantic Studios will make up the rest with a matching donation), so rob a stagecoach if you have to and pitch in.